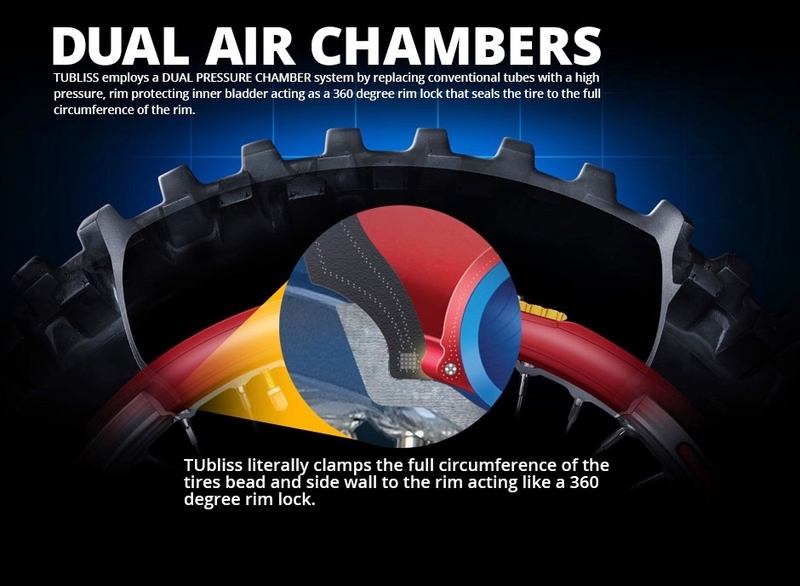 -- Please Choose an Option --	18" 19" 21"
TUbliss acts as a 100PSI bumper, providing a protective cushion against rim damage. It also stabilizes the tire closer to the rim so the sidewall stands up instead of flopping over, this allows the tire to absorb more of the impact forces before they get to the rim. INTRODUCING TWO MINUTE TIRE REPAIR, AND THE EASIER TIRE CHANGE. No tubes means you can fix flats in seconds using tire plugs. In the event of a large gash or other severe tire damage, the full circumference rim lock aspect allows for a low speed run back to civilization. Running tire sealant makes the whole system even more effective. After the initial installation, future tire changes are a cinch because you no longer have to fight with the knuckle busting inner tube. Click the button below to add the TUBLISS GEN 2 to your wish list.